When Will Emerson Electric's Fortunes Change? Emerson Electric Co. reported a disappointing set of results and guidance for the second quarter, but what should investors look out for in future? Investors in Emerson Electric (NYSE:EMR) watched on with disappointment as their company missed analyst estimates in the second quarter and lowered full-year estimates. In addition, when speaking on the earnings call, CEO David Farr's gloomily realistic commentary served notice that conditions aren't going to get any better in the near term. With that said, let's take a look at what actually happened in the second quarter and assess whether the headwinds are likely to be long-term or not. Farr began his remarks on the earnings call by referring to the quarter as "challenging tough" and outlining how the market headwinds it was facing had "become much stronger" in the last 60 days. Net sales fell 7% in the quarter, and adjusted EPS decreased 16% to $0.65, significantly below analyst estimates of $0.76. Furthermore, management lowered full-year EPS guidance to a range of $4.17-$4.32 from a previous range of $4.50-$4.60. It gets worse. If you thought that the guidance cut was simply a matter of foreign currency effects -- a strong U.S. dollar is hurting the value of U.S. exporters' foreign earnings -- then you would be wrong. In fact, management reduced its estimate for full-year underlying sales growth to 0%-2% from the target of 3%-5% given in the first-quarter results presentation. Indeed, as I outlined at the time, that guidance was also a cut from the 4%-5% figure predicted at the fourth-quarter 2014 earnings. In a nutshell, Emerson's end markets got a lot worse than management had predicted previously, and the company seems to be in firefighting mood on a few fronts. With that said, let's take a look at what went wrong in the quarter. Reported sales declined 7% with unfavorable currency movements taking 5% off sales in the quarter. Capital spending by oil and gas customers "were faster and more significant than expected" according to the earnings release. A slowdown in industrial spending, particularly in U.S. and China. Global telecommunications infrastructure spending remains weak, affecting Emerson's network power segment. U.S. residential air conditioning orders slowed as customers had prebuilt inventory in previous quarters, affecting the climate technologies segment. A combination of these issues led to a 3% fall in U.S. sales, particularly disappointing as the previous two quarters had seen 8% sales gains, and the company was increasingly relying on the U.S. to make up for sluggish growth elsewhere. Of course, when sales fall in a business like Emerson Electric, there is usually going to be margin pressure as well. It's difficult for a long-cycle industrial company like Emerson to adjust its fixed-cost base from one quarter to another -- you can't just shut down factories overnight. Indeed, as you can see in the following table, margins fell in every segment. The table above highlights a weak quarter, and the outlook isn't much better, either. For example, process management demand is expected to remain weak for the next 12 months -- partly a reflection of the weakness in energy prices. 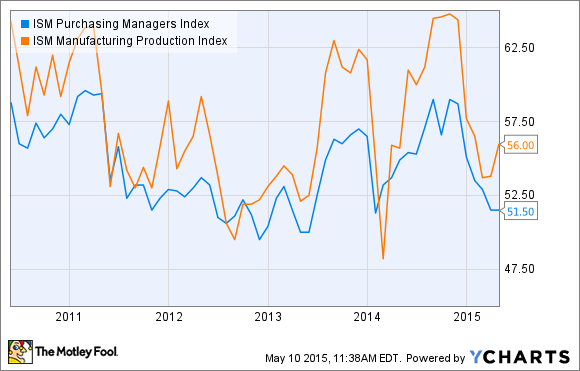 Turning to industrial automation, a quick look at the Institute for Supply Management, or ISM, Purchasing Managers Index reveals the deacceleration in the industrial sector this year. A reading above 50 indicates growth, but as you can see, the slowdown in growth has been sharp, and Emerson is not alone in seeing it. Network data is expected to see "continued weakness in telecommunications power projects" and even the segments with the strongest outlook, climate technologies, and commercial and residential solutions are expected to produce "moderate" and "modest" growth in the second half. All told, Emerson Electric has been hit by a combination of issues affecting all of its segments. Going forward, investors should focus on monitoring the industrial environment through indexes such as the ISM, as well as capital spending plans in the upstream oil and gas industry. Meanwhile, the strong U.S. dollar continues to hamper growth opportunities for U.S. exporters. Once these issues start to turn around -- and there is no guarantee they will in the near term -- then Emerson's fortunes will start to look up again.